Alaska's Northern Pike Slam Triple Threat Fly Pattern at Flathorn Lake! The bunny leech pattern is one of the most successful flies used in Alaska for big fish. 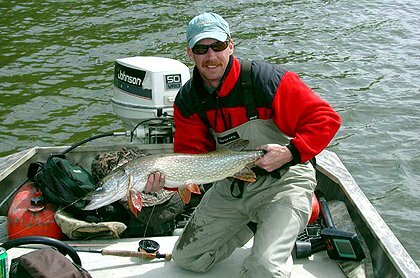 Whether its trophy rainbows, big lakers & char, or voracious northern pike, bunny fur imparts an irresistable action which big fish can't pass up. Brad shows off a hefty northern pike taken on his latest variation of a black bunny leech designed to imitate a lamprey eel. This pattern is an offshoot of a previous design, the Triple Threat articulated leech which was extremely successful on the Naknek River in the Bristol Bay region during the springtime feeding binge of big rainbows. The articulated leech is ideal for toothy predators like Alaska's northern pike because its design uses two or three flies (and hooks) combined into an irresistable pattern.